It takes a village to raise a child, and as residents of Corning, N.Y. know, it takes a neighborhood to build a playground. Since 2008, kaboom.org member CarderMom, a parent and alumnus of Carder Elementary School, has been tirelessly mobilizing the community to build a new playground for the school and surrounding neighborhood. This is no ordinary playground. Designed in part by Carder students with the help of custom playground architects Leathers & Associates, the wooden structure reflects the town's architecture, recreating some of its more iconic elements, like the town clocktower (below). 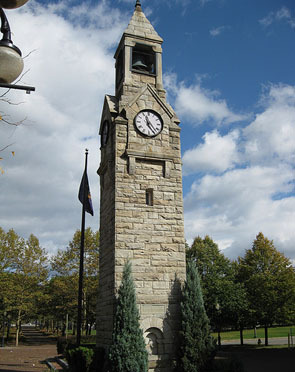 The playground gives tribute to Corning, N.Y.'s clocktower. Right photo by Doug Kerr (cc). 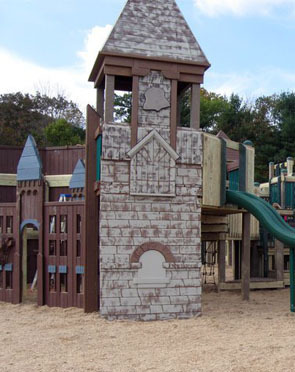 Tour other cool wooden playgrounds. Banning ice cream on playgrounds? Really?